First of all, thank you to everyone that participated in this year's Saint-O-Lantern Link up! If anyone missed adding their link, or didn't have enough time, let me know and I can open it up for a few more days. Slice the bell peppers crosswise and then cut each circle in half. Set aside the bottom part of the green pepper and 1/2" piece off of both the red and yellow peppers to use for the face. Slice the remaining peppers to use for the body. Cover a platter with lettuce leaves. 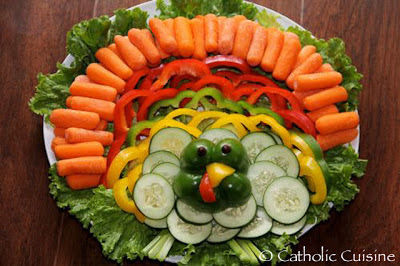 Start with making the turkey's feathers by forming a circle with the cumber slices at the bottom of the platter, followed by semi-circles of the yellow, green and red peppers. Place the baby carrots vertically above the last row of peppers. Break two toothpicks in half. Put two of the toothpicks where the eyes will go. Push the black beans onto the toothpick making sure that the toothpick doesn't go all the way through. Cut a triangle out of the leftover bottom from the yellow pepper. Attach with a toothpick below the eyes. Attach the reserved red pepper piece to the left of the yellow pepper "beak". Cut the piece of celery in half lengthwise. On each piece, carefully slice lengthwise from the end of the celery piece to almost the center. Do this twice on each piece. Place the celery in ice water and place in the refrigerator until the ends curl. (I didn't have time to do this step.) When curled, nestle the un-curled end under the cucumbers. Serve with hummus or other dip of choice. 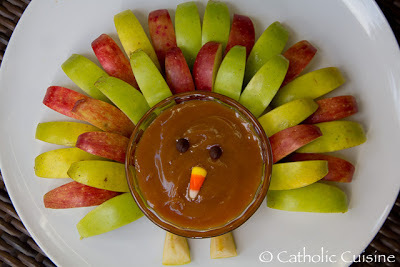 Pour Caramel Apple Sauce into round serving dish, top with candy corn (beak) and chocolate chips (eyes) and place on platter. Cut apples into wedges. Cut one wedge in half to use as feet and arrange the remaining apple wedges in a semi circle. These are great ideas and so easy! HOW DO YOU KEEP THE APPLES FROM TURNING YELLOW IF YOUR NOT SERVING IT RIGHT AWAY.